Will Bitcoins unleash fresh round of volatility in global commodity markets? Bitcoins and cryptocurrencies that were a little known phenomenon in early 2017 became larger than life by end of the year. The value of a bitcoin jumped from $900 to $19,000 in the year before, and has now plunged by 40 per cent—it was worth US $10,000 on the Luxembourg-based Bitstamp exchange on January 17—showing intense volatility. Though not recognised by any nation, cryptocurrencies have attained a stature of the inevitable and forced their way into the world commodity markets. You can buy anything, from cinema tickets to gadgets to petrol, with them. Blockchain technology, which forms the basis of cryptocurrencies, is a new way to manage data. It is a software to write a digital ledger to manage digital assets. It is nothing that the world cannot live without. But it is a novelty that would help corporations to build bigger and scalable businesses in the future. It aims to create records that cannot be hacked, databases that cannot be corrupted or extinguished. Paradoxically, over 0.9 million bitcoins have been lost or hacked till date in four separate incidents, the most famous being the Mt Gox exchange scam that came to light in 2014. So nothing is invincible or will be hack-proof. Still, according to a Juniper Research report published in September 2017 in IEEE Spectrum, a magazine edited by US-based Institute of Electrical and Electronics Engineers, nearly 60 per cent of the world’s largest companies are now researching on integrating blockchain technology for their products. The author of the article, Morgan E Peck, who is also a banker and cryptocurrency expert, rightly asks if we need blockchain, and if we do, at what cost. Chris Larsen, founder of the cryptocurrency Ripple, tipped Facebook CEO Mark Zuckerberg in December 2017 to become the fifth richest person in the world for a short duration. The price of Ripple jumped 515-fold last year, as Larsen’s personal net worth jumped to $59 billion. It is worrying that due to limited mining capacities and high speculative profits, investors are shifting funds to buy cryptocurrencies. There are more than 100 cryptocurrency billionaires in the world today. The Central banks of England, France China and India have issued advisories against investment in cryptocurrencies. Now Alaska and Idaho, two US states, have also issued warnings on the basis of a survey by the North American Securities Administrators Association, a voluntary association of 67 state, provincial, and territorial securities administrators in the 50 states of the US, the District of Columbia, Puerto Rico, the US Virgin Islands, Canada and Mexico. The report says that 94 per cent of states and provincial securities regulators believe that bitcoin and other digital currencies involve “high risk of fraud”. Yet despite warnings Zeb Pay, an app-based bitcoin exchange in Mumbai that accepts Indian debit cards, is flourishing. Since 2015, it has had 0.5 million downloads and is adding more than 2,500 users every day. The cryptocurrencies mined through blockchain technology are extremely energy intensive. There are three basic methods of obtaining bitcoins: buying on an exchange, accepting them in lieu of goods and services, and discovering, or mining, new ones. “Mining” is simply the verification of bitcoin transactions and requires certain softwares and hardware. 80 per cent of the world’s bitcoins are mined in China where both energy and computer hardware is cheap. 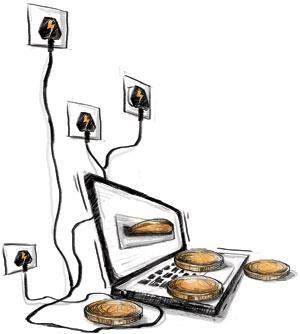 It needs huge amount of computing power to create the bitcoins that are mined at the rate of one every 10 minutes. As per Natural News, a news website, bitcoin mining consumes 0.18 per cent of the world’s electricity and has grown by 29.8 per cent in December 2017. Consuming over 30 million megawatt-hour annually, it is the fastest growing energy guzzler and had a carbon footprint of 19,504 kilotonnes last year. If it grows at this pace, as per Natural News, it will double the world’s carbon footprint in two years. In short, it is predicted to consume as much energy by 2020 as the rest of the nations. So should nations permit bitcoin mining? “The concern that people continue to debate is, where does this end?” says Michael Reed, head of blockchain technology for Intel, as per another report published in a IEEE Spectrum in September 2017. Bitcoin is unsustainable because it is an inefficient energy guzzler and billions of dollars are being pumped into research to create more sustainable alternatives. But till alternatives are found, cryptocurrencies may spike energy prices globally. Prices of crude oil, which is used to meet a large part of the world’s energy needs, have touched $68 per barrel and are predicted to soar past $80—a five year high—before the second quarter of 2018. Cryptocurrencies are not just guzzling energy or cornering investments; they have been recently granted entry into the world’s commodity markets (markets to buy and sell commodities at current or future date), where they could create havoc. In the US and Canada, cryptocurrencies have been given the status of commodities. They are widely used in the derivative market (derivative is a tradable security whose value is derived from the actual or expected price of some underlying asset, which may be a commodity, a security, or a currency) and can be bartered. The profit from their trade is subject to business income and anti-money laundering laws. Following the rapid rise of market capitalisation of bitcoin, CME Group, the world’s largest commodity exchange, announced that it will start the futures trading of cryptocurrencies before the Christmas of 2017. In its debut session on Cboe Global Markets Inc on December 10, bitcoin prices jumped by 26 per cent despite two disruptions due to heavy traffic causing temporary trading halts. Though prices fell later, bitcoins created intense volatility and speculative interest in the global commodity markets. A bitcoin trader, requesting anonymity, says he bought five bitcoins worth R3 lakh in December 2016 sold his stake for R60 lakh a year later at the CME futures exchange in Chicago. The paperwork involved in moving digital currencies is non-existent and the currencies can be traded seamlessly at exchanges. At CME you can trade agriculture commodities, energy, metals, currency and cryptocurrencies seamlessly. But the key question is whether this newfound speculative wealth will unleash a fresh round of volatility in the world’s commodity markets. As the year spans out we will come to know.